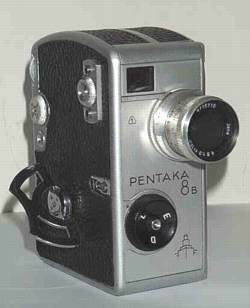 This movie camera was produced in 1960, and used a Double-8 film. This machine weights kg. 0,850 and its measures are the following: 55x127x120. It is equipped a lens Zeiss Jena Biotar da 1:2 12,5mm. The AK8 is and 8 mm. 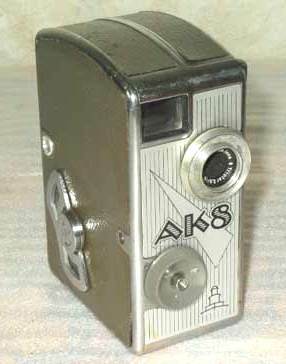 small-film shooting camera for the amateur. Its well shaped exterior, the light weight, the easy handling and the manifold attachments amplify much its scope of application. This camera is arranged for 7.5 m. double-8 daylight film-spools. It is driven by a spring motor, which can be easily tensioned by a winding key. The spring motor's pulling power, when fully rewound, amounts to about 2 m of film. With a fixed frequency of 16 pictures per second this frequency corresponds to about 30 seconds run. An acoustic signal - which sounds, when the counter proceeds - serves as a clue to determine the length of scene. There is a warning mark in the viewfinder, which releases the view-finder's vista at the beginning and appears in the vista. In view of the relatively short focal length in connection with the aperture proportion of the lens 1:2.8 10 mm. permits a fixed so-called fixed-focus setting independent of the shooting distance.